An apron helps to keep your clothes clean whenever you’re cooking, baking, washing the bathroom, cleaning your kitchen sink or even gardening. The nostalgic vintage style aprons always remind me of my grandma. She had those pretty retro aprons with big pockets, ribbons and frills. Somehow, I always associate vintage inspired aprons with baking cookies and homemade bread. My grandma was a wonderful home cook. If you’re entertaining, your stylish fun retro vintage style apron brings some cheerful laughter to your gathering or party. Of course, it’ll also help to keep your lovely dress free from stains, splashes or bacon grease. In fact, some of these glamorous 50s retro style chic aprons turn you into a sweet pin up model. Whether using as a cooking or hostess apron, the 50s style aprons with frills or ruffles look really pretty and elegant. The 50’s Retro Style Housewife Humor apron really makes your day with their humorous messages. The 1950s vintage style floral kitchen aprons give out such cheerful holiday vibes and old fashioned fun. Have fun being a 1950’s housewife in your modern kitchen with your vintage inspired kitchen apron. Yes, fifties style aprons would make wonderful gifts for retro lovers. This vintage style cherry apron is made of 100% cotton. This lovely vintage cherry print apron is decorated with candy striped trims, pocket and ruffles. It has a 35″ length and a 30″ hem. I think this cherry patterned apron looks cheerful and comfortable. Made of 100% cotton, this lovely cherries apron comes with twin front pockets and a vintage style pleated hem. This fun and pretty apron with the flattering sweetheart neckline ties at the neck and waist. It measures 30″ W x 34″ L.
A vintage inspired 100% cotton cooking apron with feminine pleated hem and front pockets. The apron measures 30″ W x 34″ L.
Featuring colorful cupcakes pattern, this retro style apron would make a lovely gift for the bakers in your life. This vintage inspired black and white polka dot apron comes with 2 deep pockets and a red and white dotted slimming looking waistband. It has an adjustable neck strap. Made of cotton, it measures 33″L x 35″W. Be the sweet Marilyn in the kitchen with this black and white polka dots apron. A retro style Mom’s kitchen apron that reminds you of the diner style restaurants of olden days. An adjustable top strap and waist tie allows for a more comfortable fit. This apron is made of 65% polyester and 35% cotton. It is available in black, red and white. This beautiful floral apron inspired by traditional palampore patterns is made of soft cotton and linen (88% cotton, 12% linen) with lace stitch embroidery. Adjustable blue ties and a ruffles trimmed front pocket add to its feminine feel. This 34″ in length vintage inspired floral apron can be machine wash using the cold, normal cycle. It comes with matching potholders and kitchen towel (buy separately) for a chic kitchen gift set. This retro style women’s apron comes in free size measuring 26″ x 28.5″. Made of poly cotton, this lovely retro apron with big front pocket can be machine washed. If you’re like me, prefer an apron that is feminine but with not too many frills, then this is perfect. The white apron with pink polka-dots accented with a green and white slightly ruffled hem and ric rac trim make this a stylish old fashioned kitchen apron that would surely impress your guests. This chic retro apron with 2 pockets ties at the waist with a big lovely checkered ribbon. It ties at the neck with another lovely ribbon. Black and white checkered ruffles run the width of the skirt hemline as well as the top part. This cute frilly apron measures 27.2″W and 28″H. You can also get this women’s apron vintage style in black with red and white checkered ribbons. Made of 100% cotton, this red retro polka dots apron ties at the waist and comes with an adjustable neck strap. The length is about 29″. It measures about 21″ at the waist part not counting the waist strap. It has a white pleated neckline and a big pocket on its right side. Remember to choose the color red when checking out as it is also available in other colors like black. It is made of 100% thick cotton with 2 ply material. There are 2 side pockets and it ties at the waist. You get lovely frills as sleeves. The shoulder straps go right over the shoulders, crisscross at the back to join back the apron at the waist. You do not feel any tugging or chafing at the back of your neck area as sometimes experienced by those wearing the halter type aprons. The shoulder straps are not adjustable. Ruffled trim on hemline and sleeves make this apron really adorable and feminine. The height of this vintage inspired bib apron is about 30″. You have a choice of 8 different colors to choose from. Although not as feminine with frills and ruffles, this grill master 600 denier polyester apron kit would make the person who loves to grill extremely happy. Measuring 24″ x 32″, it comes with detachable neck strap as well as side tie strings. There are mutiple pockets for your grilling tools including an adjustable insulated storage pocket for beverages. Also included is a detachable bottle opener, padded oven mitt as well as a towel. This vintage style cotton apron comes embroidered with the phrase “I take life with a grain of salt, a wedge of lime, & a shot of tequila”. Multi ruffles at the hem gives it a more feminine look. The neck strap is adjustable for a more comfortable fit. This lovely retro green apron is made of 100% cotton. It features a V-line slim fit. The big front pocket comes in handy for small kitchen tools. It comes printed with the words “The perfect pair” and personalize with the couple’s names. 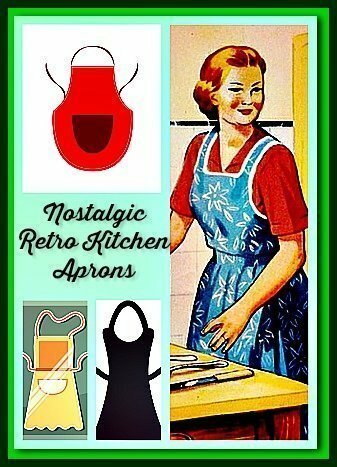 The nostalgic vintage style aprons for women certainly make wonderful gifts for mom or anyone who loves to cook. In fact, if you have one of these lovely retro bib aprons, you’ll find yourself more often in the kitchen cooking your favorite food.